Often we ponder when were Indians in the country exposed to the communist ideology? Was it before World War II or after? Some even deny that Indians were communists at all. . There have been evidences to support and prove that Indians labourers were exposed to communist ideology as early as 1936. It is more interesting to learn that the propaganda leaflets were printed not only in Tamil language but also in Telugu language as well. This should open up our minds to agree to the notion that Telugu labourers too played substantial roles in the left labour movement in the country. 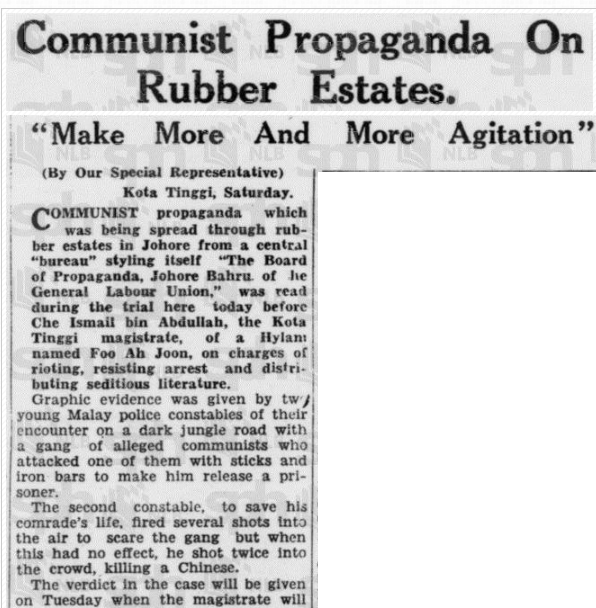 The Straits Times reported on the 6th January 1936, communist propaganda materials were found on a Hainanese - Foo Ah Joon who were caught for rioting and distributing seditious literature. "Son of the soil! The collies working on estates are suffering much as the price of rubber has gone down. There is no demand for rubber and the collies' wages have been reduced. The duty on all goods is very heavy. Even for running a business with a view to carrying on a livelihood the Government requires a licence. Disputes are going on between the Governments of other countries and the above mentioned government. Continue to make more and more agitation"
"We, Indians Malays and Chinese labourers are all nice people. Now is the time for us to get united. Beware and watch how things will be when the Chinese emperors creates trouble and calls for a meeting. Now that there is a surplus of rubber on every estate we are facing difficulties. Nevertheless, there is nothing to be afraid of. This is all the white man's doing. Let us try to help each other financially." 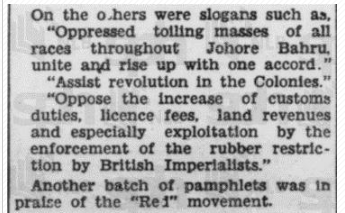 1941 Klang Strike - Labourers Peddled Spearding Call for Strike - The Straits Times 14th May 1941. This blog is dedicated to Ahmad, Ah Chong and Ramasamy - labourers who built this country. Their struggles still continue to present day. Malaya Ganapathy by Saminathan Munisamy is licensed under a Creative Commons Attribution-NonCommercial 4.0 International License. No material anywhere on this blog may be reproduced without the concern of author. Simple theme. Powered by Blogger.